Reality is a gay bar with an interior in tropical style and Latin and Caribbean music. With this, it presents itself as the "The Hottest Black & White Gay Bar in Town". The Reality Bar is popular by black gays, wherever they come from, and by everyone else who like the latin and multicultural atmosphere. In 2015, the interior was completely refurbished. There's also a small terrace all the year round. Number 129 Regulierdwarsstraat has been a bar for decades. In the seventies it was for example a somewhat more distinguished cafe called La Reserve. 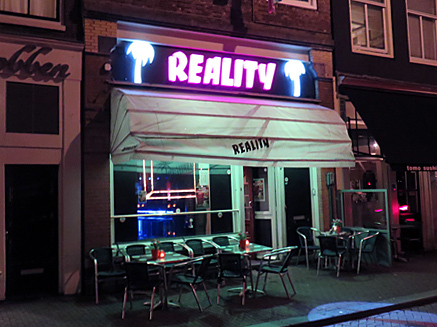 Reality Bar was opened here on January 1, 1996 by a man from Surinam, and his place attracted many black gay men from gay dancing Havana at the other end of Reguliersdwarsstraat. Having a place for their own was a breakthrough in the Surinam and Latin-American community.